This year for Christmas, I would love to get Poop Slime!" Well, in my house, IT HAPPENED! lol! 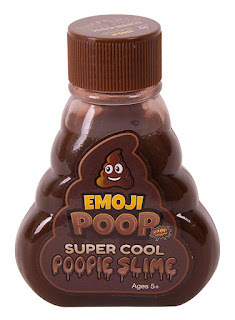 Both my 8 year old son and 9 year old daughter have requested poop slime! The Emoji Poop slimes are $4.95 each, and certain to bring a smile to your kiddos faces! Now, if Poop products aren't quite what your kiddos are into, Kangaroo Manufacturing offers many other selections of super cool slime to fill their stockings all at the $4.95 price point. There is Unicorn Slime, Jurassic World Slime, Glow in the Dark Slime, and the Super Cool Original Slime! My kids LOVE them all, and made you a little video of them trying some out. The Original Super Cool slime is SO COOL! It feels wet and cold and has the most amazing coloring to it! If you look closely at the picture, you can see how it is "galaxy" looking with greenish-pinkish-goldish color combo. The Jurassic Slime comes in green, blue, and black and he loves it. There is also the glow in the dark that quickly became a favorite for him. Glow in the dark comes in blue, green, or yellow. As gross as Poop Slime sounds.... He IMMEDIATLY made it be "mud" for his cars to drive through, This continued for HOURS! None of the ones we tried are sticky and it leaves absolutely NO MESS on their hands, the table, their clothes... absolutely no where! They have had the best time with this slime, and it's the first thing they go to for after school play. I even caught my teenaged daughter playing with it! Your kiddos will not be disappointed to find any of these awesome slimes inside their stocking this Christmas season!